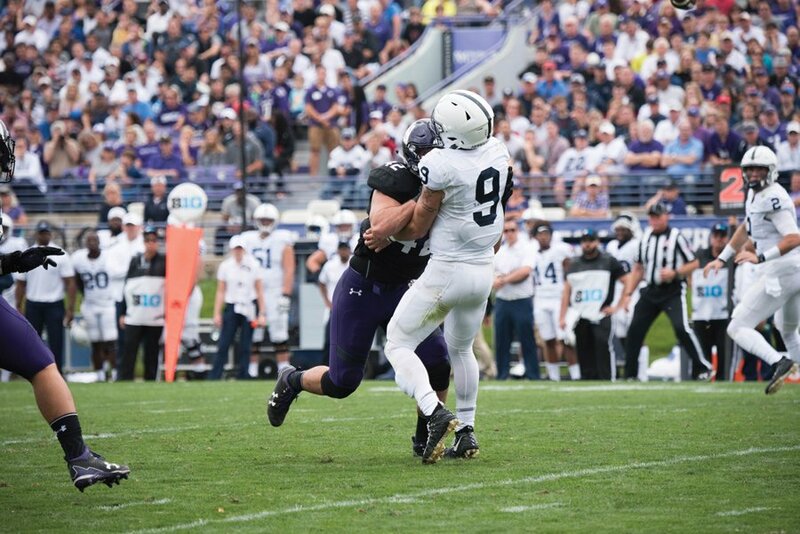 Paddy Fisher tackles Penn State quarterback Trace McSorley. The redshirt freshman won two weekly awards after his standout performance Saturday against Michigan State. Linebacker Paddy Fisher was named Walter Camp FBS Defensive Player of the Week, the foundation announced Monday. The redshirt freshman was also named Big Ten Defensive Player of the Week. Fisher earned the awards after a dominant performance in Northwestern’s dramatic 39-31 triple overtime win over then-No. 16 Michigan State on Saturday. In the win, Fisher registered 14 solo tackles, tied for the most in a single FBS game this season. Fisher’s 73 tackles this season are the most by a freshman in the FBS. Fisher has filled big shoes at the linebacker position after taking over for Anthony Walker, who declared for the NFL draft following his junior season. Walker, considered one of the best Wildcat linebackers since coach Pat Fitzgerald donned the purple and white as a player, was drafted in the fifth round by the Indianapolis Colts after a successful collegiate career that included All-American recognition after his sophomore season. Fitzgerald said he’s been impressed with Fisher’s work ethic.